If you work at an office, you probably have several printers added to your computer that are network printers, i.e. not connected directly to your computer. However, as you move around in the company or printers die out, that list has to be cleaned up every once in a while. Sometimes when you try to delete a network printer, you may get a message from Windows saying “Cannot delete network printer” and that’s it! Great, so now you have useless printers clogging up your printer list. Luckily, there is a way to remove any network printer from your computer via the registry. Note that you will have to be an Administrator in order to do this. Before you make any changes, make sure to read my post on backing up the Windows Registry. If you prefer not to mess with the registry, there is another possible solution that I list below that could also fix the problem, so be sure to scroll down. 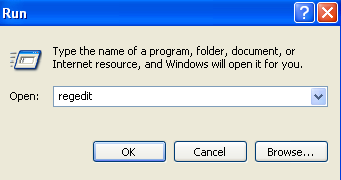 Step 1: Click on Start, Run and then type in regedit and press Enter. This will open the registry editor. 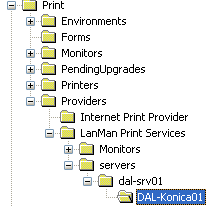 Here you should now see a list of all network printers with the server name first, then a comma, and then the name of the actual printer. Now under the servers key, you should be able to expand it and see the name of the print server that actually hosts the printer you want to delete. 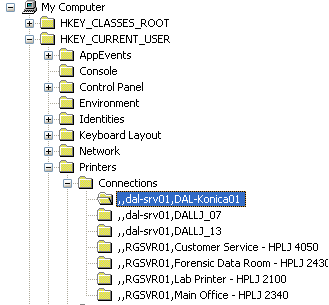 Go ahead and expand the print server key and delete the printer from the list. It is also a known issue that you will not be able to delete a printer if there is a print job stuck in the printer queue. You can tell if a print job is stuck by going to the C:\Windows\System32\spool\PRINTERS\ folder and making sure it’s empty. If not, then you can follow my previous article on forcefully clearing the printer queue in Windows. Once you clear the printer queue, you should be able to delete the printer from your system. If you need to install the printer back onto your computer, check out my post on how to install a network printer on your home or office network. Enjoy!